A 3-year-old boy presented with bicuspid aortic valve and severe aortic stenosis. In addition, he had anomalous drainage of the left upper pulmonary vein (LUPV) which besides draining into the left atrium (LA) joined the innominate vein through a patent levoatriocardinal vein (LACV). This dual drainage, an unusual form of partial anomalous pulmonary venous connection, led to left to right shunt despite intact atrial septum. Severe aortic stenosis and the consequent elevation of left ventricular end diastolic pressure arguably promotes the shunt and is expected to decrease after successful balloon aortic valvuloplasty. Therefore, the partial anomalous pulmonary venous connection was not addressed at the time of balloon aortic valvuloplasty. 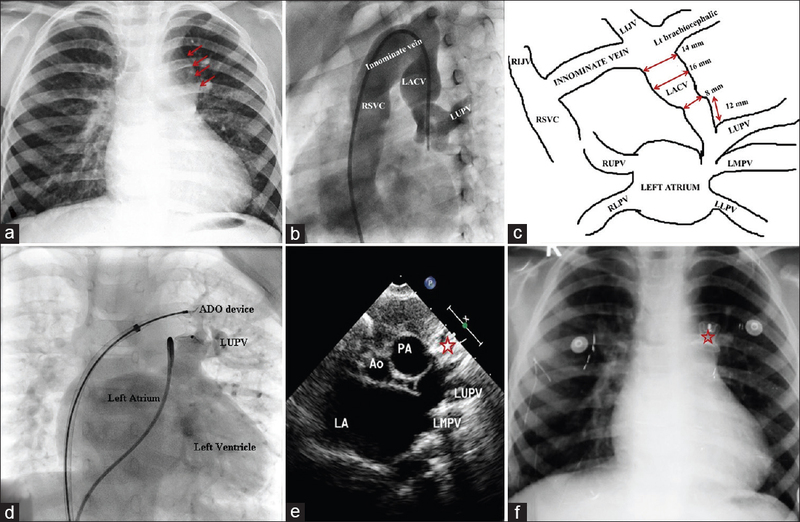 However, despite successful balloon aortic valvuloplasty, the left to right shunt persisted with progressive dilatation of innominate vein, right atrium and right ventricle during follow-up [Figure 1]a. The presence of normal connection to the LA, in addition to LACV, makes it an ideal candidate for interventional therapy. An interventional closure of patent LACV was, therefore, contemplated. The ratio of pulmonary to systemic blood flow was 2.5, and pulmonary artery pressure was mildly elevated. The main concern was the risk of obstruction to the LUPV egress in the LA following device placement. The vertical length and mild constriction of the vertical channel above the joining of LUPV [Figure 1]b, [Figure 1]c and [Video 1] provided safe landing zone for the occluder device. The LACV was entered with 7 Fr Swan-Ganz balloon floatation catheter, through which a 0.35” Amplatz extra stiff exchange length wire was parked in the LA. A 9 Fr Mullin's sheath was then placed over the wire through which a 14/12 mm Amplatzer duct occluder (AGA Medical Corporation, Golden Valley, Minnesota, USA) was deployed. The position of the device and the status of the flow in LUPV were confirmed with angiogram [Figure 1]d and [Video 2], [Video 3] and echocardiogram [Figure 1]e and [Video 4]. On follow-up, the child is symptomatically better with a significant reduction in the size of innominate vein, right atrium, and right ventricle [Figure 1]f.
This case illustrates the feasibility of complete interventional cure of select cases of partial anomalous pulmonary venous drainage with dual drainage.